The Rockstar Energy Husqvarna Factory Racing Team went international for the ninth round of AMA Supercross, held at the Rogers Centre in Toronto, Ontario on Saturday. 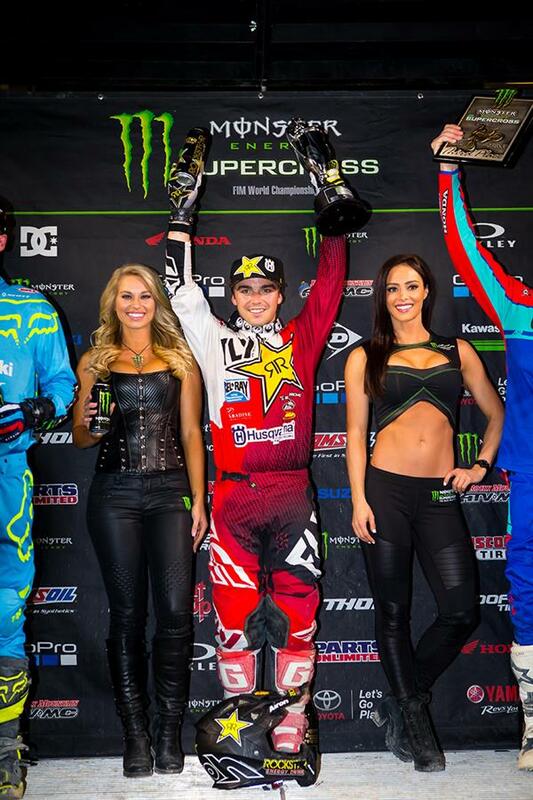 Zach Osborne excited the crowd with his second victory of the season in the 250SX East class. He currently has a comfortable lead in 250 rider point standings. Teammate Dean Wilson earned another top-10 finish in the 450 class, while Jason Anderson suffered from a flat front tire. Zach Osborne displayed impressive speed the entire day. After qualifying first aboard his Husqvarna FC 250, he started in the top-10 in his heat and came through the pack to finish third and earn a transfer position to the main. In the main, he pulled a top-five start and navigated his Husqvarna FC250 into third by the end of the first lap. He stayed on the gas and put in some impressive laps before making the pass for the lead in lap seven. He soon started pulling away, and held on for the win and a nearly 10 second lead. He is currently leading in 250SX East rider point standings. Dean Wilson qualified fourth in the 450 class, and had his sights set on another top-10 finish in the main. He got a mid-pack start in his heat and moved through the field to finish sixth, just two spots outside a transfer position. He got a good start in the 450 semi, was third by the third lap, and went on to finish third and qualify for the main. He pulled a top-10 start in the main and worked his way up to eighth by the sixth lap. He held strong the remainder of the race and finished eighth. He is currently ninth overall in 450 rider point standings. “I got another top-10,” said Wilson. “That’s where I’m supposed to be. The day was OK. I’m just not really stoked on my riding. My qualifying time was good – I was fourth. I mean my speed is good, but doing it in the race is what counts. I just got really tight out there and was in survival mode. It’s a little disappointing because I’ve beat guys that have already gotten podiums, and I want to be up there. It’s just a building season for me, so I’ve just got to learn from it and have a good week." Jason Anderson started the night strong by finishing second in his heat, earning a direct transfer to the 450 main. In the main, however, Anderson’s front wheel made contact with another rider’s foot peg resulting in damaged spokes. He pulled into the mechanic’s area shortly thereafter to change it, but got hit again later in the race. He would eventually finish the race in 19th. Osborne, Anderson and Wilson will now make their way to the 10th round of the series to be held next Saturday at the Daytona International Speedway in Daytona, Florida.